Old City Publishing is pleased to announce two new metallurgy and materials science journals as part of its new UK-based OCP Materials Science & Engineering division. International Journal of Peening Science and Technology (ISSN: 2473-506X (print) / 2473-5078 (online)), edited by Pratik Shukla of Coventry University, aims to provide a global and multidisciplinary forum for the exchange of the science, technology, developments, and applications surrounding the wide variety of peening techniques available. 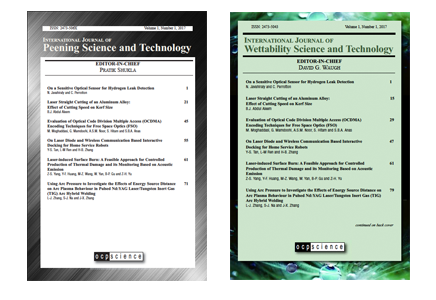 International Journal of Wettability Science & Technology (ISSN: 2473-5035 (print) / 2473-5043 (online)), edited by David Waugh of Coventry University, will publish research articles, reviews, short communications and letters relating to the field of wettability science, associated technologies and applications. Both journals are now accepting submissions with the launch of the inaugural issues expected in 2018.